Mr Simon Thompson, who was Principal of Midleton College until last August, returned to the College yesterday for some formal ceremonies of farewell. Staff and students spoke at a special full assembly of the school (all staff and all students) at midday, when a presentation of an especially commissioned silver scallop shell was made to Mr Thompson. The scallop shell features in the school crest and is the symbol of pilgrimage and journey, as well as of new beginnings in baptism. In the afternoon the former Principal was entertained by the Parent-Teacher Association and last evening the Board of Governors hosted a dinner for Board members and former Board members as well as Deputy Principals who worked with Mr Thompson. On behalf of the Boards, the Chairperson, Dr Paul Colton, presented Mr Thompson with a carving of bog oak aptly named ‘New Horizons’ which features a child at its centre. 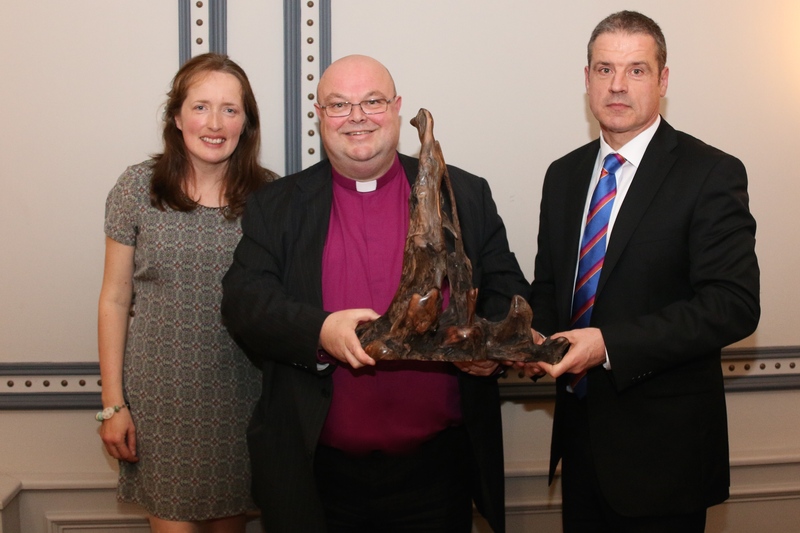 Dr Paul Colton, Bishop of Cork, Cloyne and Ross, Chairperson of the Boards of Midleton College, makes a presentation to the school’s formal Principal, Mr Simon Thompson and to Ms Grace Hamilton. This entry was posted in Diocese, Schools in the Diocese. Bookmark the permalink.